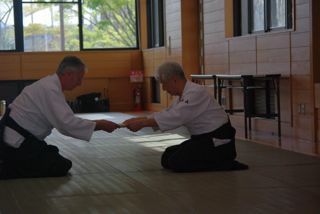 Is Aikido passing to the West? 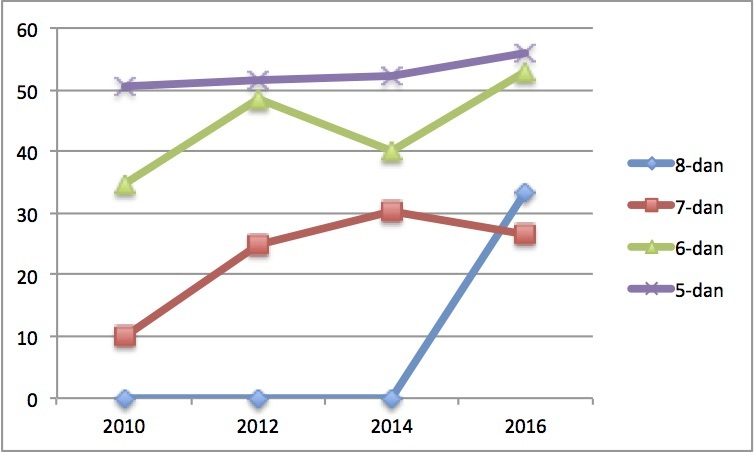 The figure shows the percentage of total dan grades awarded to gaijin through Aiki Kai hombu dojo over time. I plotted only 5-dan and higher for two reasons: firstly because I ran out of fingers and toes; and secondly at these levels what’s issued from hombu is a reasonable aggregate of those issued by this organisation globally. Throughout the time period you can see a trend of more awards going to the west over time. It’s seems reasonably clear the hump of foreigners is working its way up the dan ranks in the mainline Aikido organisation, having passed unity (50%) quite some time ago in the lower listed ranks. Another possible indicator, when I look around my own backyard, is the increasing number of independent organisations not affiliated to Japan, I suspect this is approaching unity as well. Caveat: Of course the trends aren’t a “real” statistical treatment (n=3 for 8-dan in 2016 for example) but it’s a start and fairly robust for the more junior ranks. I couldn’t find any earlier data than 2010, so a shout-out there to aikido land if you have some promotion lists from earlier that would be a useful inclusion.